Fox News is reporting that "Don't Tread on Me," ie. Gadsen flag license plates may be hot commodities in three different states. California, you say? Nope. New York? Not quite. Massachusetts, New Jersey, Oregon? Nope, nope, nope. I think I saw a Gadsen flag license plate in Southern Virginia (which is very southern actually) but am not sure. I think it was on the front of the vehicle where tags are not required. Back to the chosen-Gadsen Three. 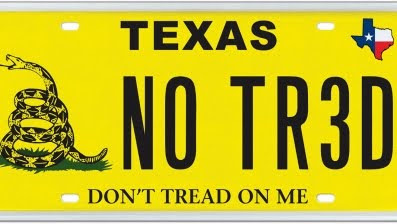 "Don't Tread on Me" license plates are possibly going to soon hit the (prison?) assembly line in Virginia, Texas has already approved the plate and Nevada has it under consideration (I'm surprised Montana isn't included). I wonder which LCR reader is going to get one of these? I get them right now, but I believe under moonbeam's governorship, they're illegal.